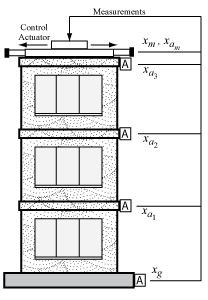 This example uses systune to control seismic vibrations in a three-story building. 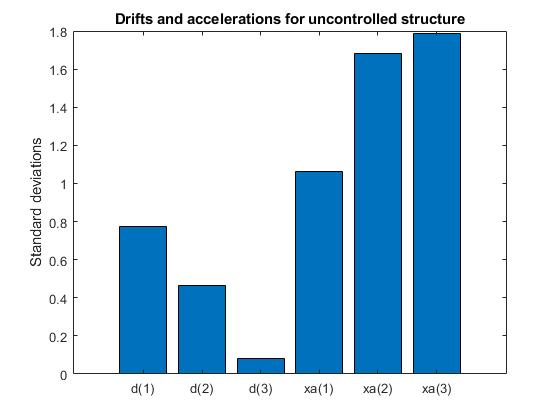 This example considers an Active Mass Driver (AMD) control system for vibration isolation in a three-story experimental structure. This setup is used to assess control design techniques for increasing safety of civil engineering structures during earthquakes. The structure consists of three stories with an active mass driver on the top floor which is used to attenuate ground disturbances. This application is borrowed from "Benchmark Problems in Structural Control: Part I - Active Mass Driver System," B.F. Spencer Jr., S.J. Dyke, and H.S. Deoskar, Earthquake Engineering and Structural Dynamics, 27(11), 1998, pp. 1127-1139. 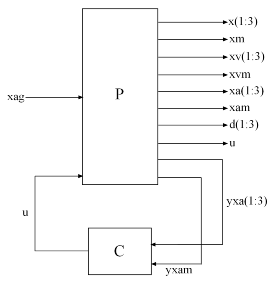 The inputs are the ground acceleration xag (in g) and the control signal u. We use 1 g = 981 cm/s^2. State-space model with 20 outputs, 2 inputs, and 28 states. 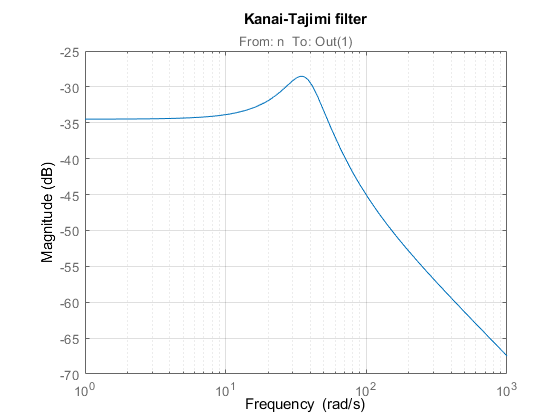 The earthquake acceleration is modeled as a white noise process filtered through a Kanai-Tajimi filter. The effect of an earthquake on the uncontrolled structure can be simulated by injecting a white noise input n into the plant-filter combination. 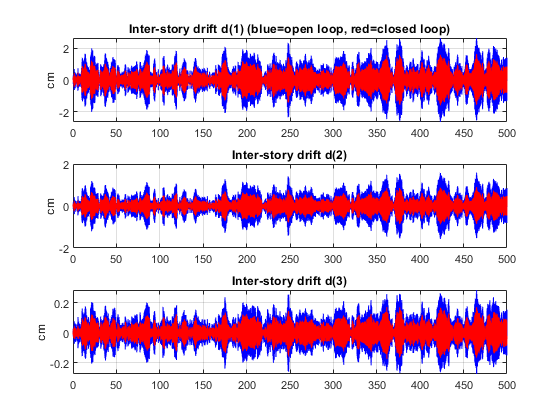 You can also use covar to directly compute the standard deviations of the resulting inter-story drifts and accelerations. The control structure is depicted in Figure 2. All design requirements are assessed in terms of standard deviations of the corresponding signals. Use TuningGoal.Variance to express these requirements and scale each variable by its open-loop standard deviation to seek uniform relative improvement in all variables. systune lets you tune virtually any controller structure subject to these requirements. 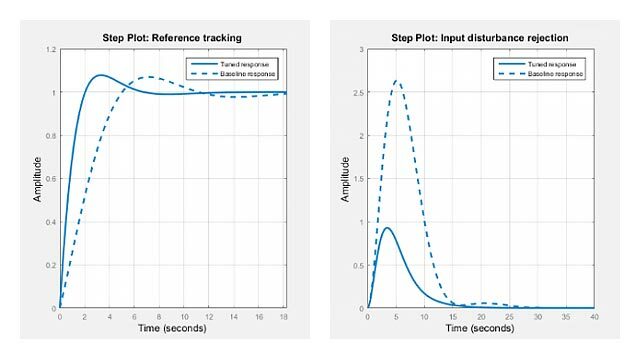 The controller complexity can be adjusted by trial-and-error, starting with sufficiently high order to gauge the limits of performance, then reducing the order until you observe a noticeable performance degradation. For this example, start with a 5th-order controller with no feedthrough term. Construct a tunable model T0 of the closed-loop system of Figure 2 and tune the controller parameters with systune. The summary indicates that we achieved an overall reduction of 40% in standard deviations (Soft = 0.6) while meeting all hard constraints (Hard < 1). 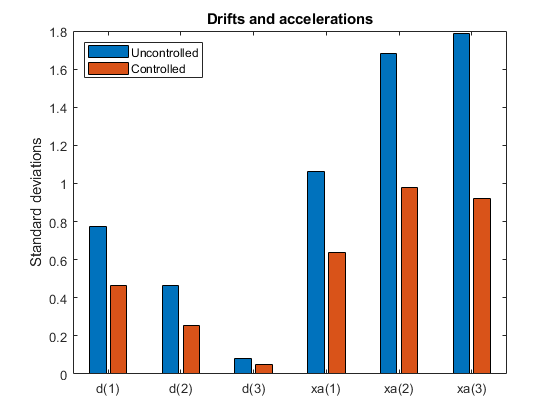 Compute the standard deviations of the drifts and accelerations for the controlled structure and compare with the uncontrolled results. 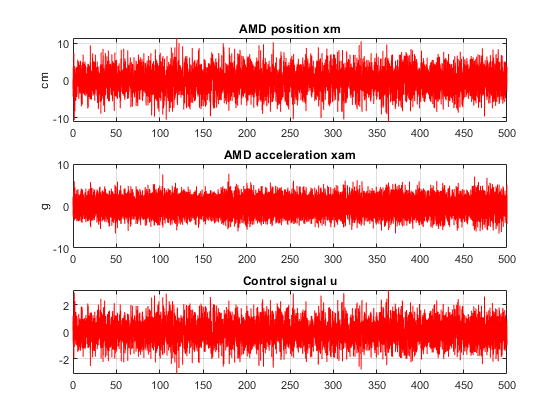 The AMD control system yields significant reduction of both drift and acceleration. 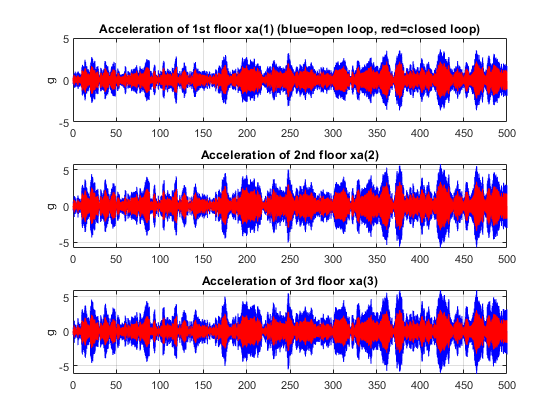 Simulate the response of the 3-story structure to an earthquake-like excitation in both open and closed loop. The earthquake acceleration is modeled as a white noise process colored by the Kanai-Tajimi filter. Plot the root-mean-square (RMS) of the simulated signals for both the controlled and uncontrolled scenarios. Assuming ergodicity, the RMS performance can be estimated from a single sufficiently long simulation of the process and coincides with the standard deviations computed earlier. Indeed the RMS plot closely matches the standard deviation plot obtained earlier. Overall, the controller achieves significant reduction of ground vibration both in terms of drift and acceleration for all stories while meeting the hard constraints on control effort and mass displacement.